Your Bike Has Never Been Safer! Are you always worried that someone will steal your bike? Do you not trust regular bike locks and chains, because they're easy to pick, cut or drill? Your bike will now be impossible to steal, thanks to folding bike lock with the high security hardened steel shackles. The cut and drill resistant bike lock is impossible to break, so your bike will be protected when you park it outside. And if it starts raining, don't worry! The stainless steel lock will not get rusty and the joints will still rotate smoothly. e. It's easy and fast! Mount The Folding Lock On Your Bike Frame! When folded, the steel bike lock is very small and compact. But you don't have to store it in your bag. When you're riding your bike, you can hang the folded lock on its frame. How can you do that? Lock has included all the parts you need to build and attach a mount setting which you can use as a case for the folding lock. The Steel Lock Won't Scratch Your Bike! Trust us! 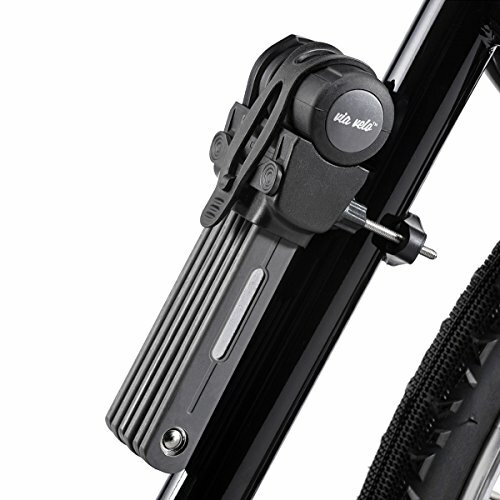 Even though the folding lock is made with hard rock metal, it will not scratch or damage your bike's frame. The special rubber paint coating of the foldable lock will keep your sleek bike frame in great condition. This is the most secure and practical bike lock on the market, so don't waste any more time. Add The Folding Bike Lock To Your Cart NOW!